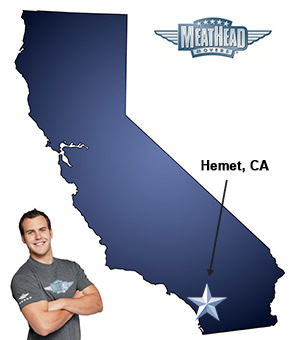 Whatever your moving needs may be, Meathead Movers will help you feel at home in Hemet. Our professionally trained student-athlete movers and our moving concierge will be with you for the entirety of your move to Hemet. Welcome to Meathead Movers of Hemet! Hemet is a small town located in the San Jacinto Valley. With beautiful outdoor vistas and developed retirement communities, Hemet is the ideal place to relax and escape the hustle and bustle of urban Southern California life. If you are moving to or from anywhere in Hemet, we are the moving company for you! Our professionally trained student-athlete movers and our move concierge are here to help you with every stage of your move in Hemet. Our moving company specializes in local, long-distance, and commercial moves to, from, and Hemet. We also provide reliable packing, storage, on-site relocations, and our distinctive moving concierge service which connects you with local service providers in the area. All our student-athlete movers are thoroughly screened and trained before their very first move. With branches not just in Hemet, but all throughout California, we are your one-stop resource for all your moving needs, no matter where you’re California move takes you. In fact, see what your neighbors in Hemet have to say about us. With our 100% satisfaction guarantee, the only thing you have to lose is the stress that comes from moving! So contact us today for a free no-obligation moving quote and to learn how we can help you on your next move! The movers were kind and informative. They also took great care packing, loading and unloading my stuff even though it's not high end stuff. All in all, they made a stressful day much less stressful. Thank you Angel and John and MM staff. You were awesome! Very efficient everything wrapped nicely. Exemplary customer service. Making all arrangements was made simple even when we had to make some changes and adjustments. The contract was clear and easily understood. Everything was accomplished on time exactly as promised and our two movers, Michael and Ivan could not have been nicer or more professional. The movers were very professional and careful with my furniture. No profanity was used and they worked very hard. Jenny helped us schedule everything and was an absolute joy to deal with!! The Princess Packers, Shelsea, Suzette and Karina, took excellent care of our items in packing. They made sure each box was labeled with details of contents, and were so friendly throughout the process that we felt like they were family helping us. I can't express enough thanks to Meathead Movers/Princess Packers for helping us complete this stressful move with a lot less stress!!! Many, MANY thanks!!! Our movers were on time, extremely professional as well as friendly. They even did some "extras" for us gladly and graciously. They were fast, but efficient and careful with all of our belongings. We were extremely happy with the service, and would use this company again and recommend it to others.